Place lamb cubes in sealable plastic bag. Combine apple juice, Worcestershire sauce, garlic, lemon pepper and ginger. Pour over lamb, turning to coat. Refrigerate for at least 2 hours and up to 24 hours. Remove meat from marinade, discard marinade, and thread on skewers, alternating meat, apples and vegetables. In 1-quart saucepan, combine apple juice and onion and simmer for 2 minutes. Stir in chili sauce, applesauce, brown sugar, Worcestershire sauce, dry mustard and red pepper sauce. Simmer for 10 minutes, stirring occasionally. Remove from heat. 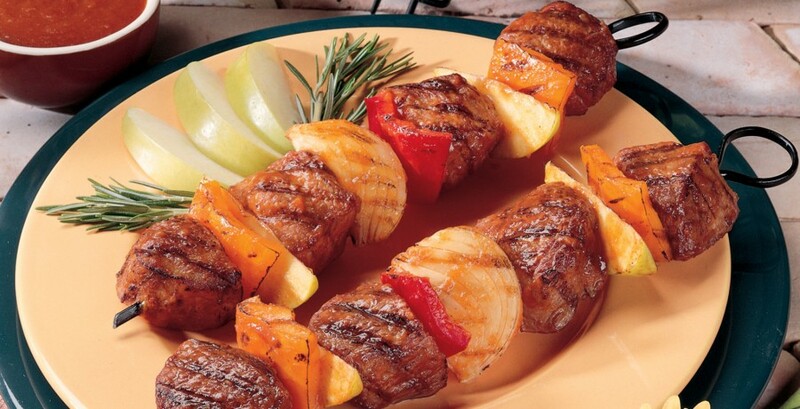 To Broil: Place lamb kabobs on broiler pan which has been lightly oiled or sprayed with nonstick coating. Broil lamb 4 inches from source of heat. Brush with barbecue sauce and turn kabobs occasionally while broiling. Continue to brush with barbecue sauce. Cook approximately 12 to 18 minutes or to desired degree of doneness. 0.27 mg vitamin B6, 2 mcg vitamin B12, 2 mg iron, 5 mg zinc.